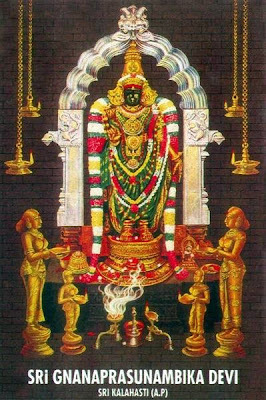 To Perform Pooja For Kala Sarpa Dosha - Visit Sri Kalahasthi Kalahatheeswarar Temple. 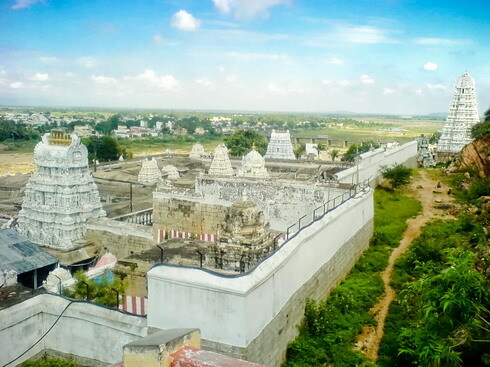 Kalahasthi temple is one of the Pancha Bootha Sthalam and , represents the Vayu Sthalam . This temple is located in Chitoor district in Andhra pradesh. 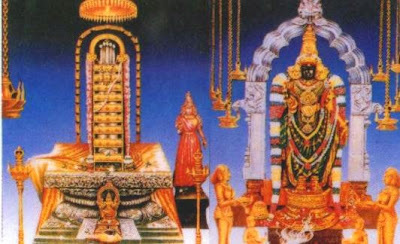 Sri Kalahasthi temple is situated 36kms away from Tirupathi and it is the only shrine for the God of Vayu . This temple was construced by the Chola King, Rajendra Chola . Vayu is incarnated as Lord Shiva and worshipped as Kalahasteeswara. Goddess Parvathi devi is worshipped here as Gnanaprasunambika. This temple is also associated with Rahu and Ketu, (of the nine grahams or celestial bodies in the Indian astrological scheme). Sri Kalahasti Temple is also famous for performing poojas for Sarpa, Rahu, Ketu Doshas. People come here and perform pujain for "Kala Sarpa Yoga". Before Reading further Note this Point. Guruji Sri Narendra Babu Sharmaji keeps on insisting in this point. Am repeating this point once again, for those who have missed my previous posts. Vishwakarma brahmin Sthapthis was the one who sculpted this temple. This temple features an enormous, ancient Gopuram over the main gate. The entire temple is carved out of the side of a huge stone hill. The temple is surrounded by two sacred hills, The Durgamba temple is found on the northern hill, while Kannappa Nayanar temple on the southern hill. It is found on the banks oif the river Swarna Mukhi. The Lingam here is swayambu , and it is white in colour. The Main lingam is untouched by the human beings , even by the priest. Abhishekam is done by pouring a mixutre of water , milk, camphor and panchamrita. Sandal paste , flowers, and the sacred thread are offerred to th e Uthsava murthi , not the main Lingam. There is a lamp inside the inner sanctum that is constantly flickering despite the lack of air movement inside. The air can be observed even when the priests close the main deity room, which does not have any windows. One can see the flames on several ghee lamps flicker as if blown by moving air. The temple is also associated with Rahu and kethu, as per astrology to be redeemed from the clutches of Sarpa dosham. The temple is considered as the Kailash of the south or Dakshin Kailash. This ancient Sri Kalahasti temple dedicated to Lord Siva is one of the five Panchabhootha stalams (temples celebrating Lord Siva as the embodiment of the five primary elements), air (wind) being the element in this case; the other elements being water at (Thiruvanaikaval), fire at (Annamalaiyar Temple), earth at (Ekambareswarar Temple) and space at (Chidambaram Temple) that Siva embodies. 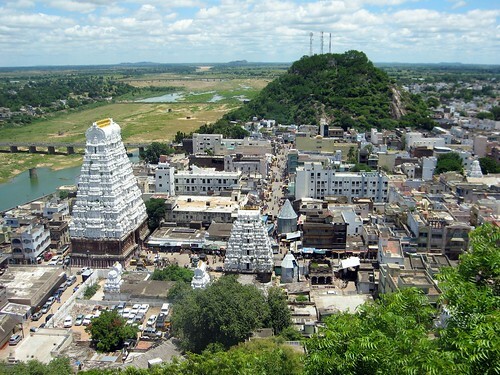 Sri Kalahasti is named after the staunch devotees of Lord Shiva. They were the Spider (Sri), the Serpent (Kala) and the Elephant (Hasti). Appeased with their unflinching devotion, Lord Shiva gave them a boon that their names be merged with the Vayulinga and called as Sri Kalahasteewara. According to Hindu mythology, the elephant or Hasti used to clean the Shiva deity by watering the idol with the help of river-water carried in his trunks and pray for him by placing Bilva leaves. The spider or Sri tried to protect the deity from external damage by weaving his web and to provide shelter for the Shiva lingam. The snake or Kala used to place its precious gem on the linga to adorn the lord. In this way, they all worshipped the Vayu linga separately without knowing what the other was doing. One day, the spider had built a very big and thick web around the deity to protect it from dust and weather while the snake places its gem. The elephant not knowing this and assuming that this form of puja by Sri and Kala is a desecration by the seeming miscreants, pours water on it and cleans it up. This causes a war between the three. The snake punishes the elephant by entering its trunk and in the process kills itself while the elephant runs amock and hits its trunk and head against the shiva linga. During this struggle, the spider is squashed against the linga by the elephant's trunk and the elephant dies due to the snake's poison. Lord Shiva then appeared and gave moksha to all three of them for their selfless devotion. The spider takes rebirth as a great king while the elephant and the snake reaches heaven for satisfying all its karma. The spider was Vishwakarma's (architect of the deva ganas) son Oornanabha. He was replicating Brahma-the creator's job and an annoyed Brahma cursed him to become a spider. The snake was once cursed by Siva himself. The elephant was a Deva (Pramadha) cursed by Siva's wife, Parvathi, when he intruded their privacy! The Siva linga at Srikalahasti is an amalgamation of the three animals. This king continues his good work from his previous birth and builds a variety of temples that seeks to protect the underlying deity with tons of stones. It is interesting to note that all his temples, keep the deity beyond the access of an elephant. In this temple, access to the deity is through a narrow passage in the side of the building that prevents an elephant from extending its trunk over the lord from any side. At Sri Kalahasti, Lord Shiva tested the unshakable devotion of Kanna (Later became Bhaktha Kannappa) before the sages gathered at SriKalahasti. With his divine power, Lord Shiva created a tremor and the roof tops of the temple began to fall. All the sages ran away from the scene except Kannappa who covered the linga with his body to prevent it from any damage. In another incident, Kannappa plucked out one of his eyes and placed in the eye of Linga which was oozing with blood and tears. When the tears and the blood were still trickling from another eye, Kannappa decided to remove his second eye and placed one of his feet on the spot of the right eye of the Shiva Linga. Before he could pull out his second eye with the arrow, Lord Shiva appeared and restored his eye while granting him a boon to occupy a place close to him. According to Swami Sivananda's book, Sixty-Three Nayanar Saints, pg. 44, some Saivite traditions believe that Kannappa was the reincarnation of Arjuna. Arjuna, worshipped Siva for seeking the Pasupatha Astra and failed to recognize Him in the form of a hunter. Thus, according to this tradition, Arjuna had to be born as a hunter and adore the Lord before attaining final liberation. This belief is not adopted by all Hindus. Dhoorjati Maha Kavi(poet) written Sri Kalahasti Mahtyam in Telugu at Krishna Devaraya times. Sri Kalhasti temple is situated near by Suvarnamukhi River. Mayura, Chandra and Devendra were also freed from their curses after taking bath in the river Swarnamukhi and prayed at Srikalahasti. Patala Ganapati is a small underground temple located in the temple complex. Pilgrims should make it a point to visit this interesting place. One has to bow down carefully to worship this Ganapati 20 feet below on a very narrow staircase. The Rahu Ketu Sarpa dosha nivarana puja is a popular puja undertaken by devotees at this temple. This is offered in three variations, all of which serve the same purpose but offer varying degrees of comfort and special treatment for the devotee. There are 3 rates for pooja; Rs. 250/, Rs. 1000/- and Rs. 1500/-. While Rs. 250/- pooja is performed outside prakaram (a wall surrounding main temple premises), Rs. 1000/- pooja is performed within in prakaram (at Subramanya swamy temple), and Rs. 1500/- is performed within temple premises. While you can perform pooja at any time, performing pooja during rahu kalam is considered to be auspicious. The puja is not a fire ceremony(homa/havan). It's mostly about praying to the two (snake like) metal representations of Rahu and Ketu and doing offerings with kumkum(vermilion) and haldi(turmeric) powders and flowers while repeating the mantras which the Priest recites. During Pooja You'll be asked to tell the priest your name and gotra. The process takes not more than 20 - 30 minutes. Dont be surprised when the priest murmurs something in your ears like a mantra, after the puja.. and you hear something like 200 rs.! yeah, he's refering to the dakshina! you are required to keep 2 crisp 100rs notes on the betel leaf and hand it over to him. I told you, its inevitable! c'mon, someone who spends 1500 per head for a puja shouldnt be bothered about shelling out another 200 bucks, eh? After the puja, one should take bath and discard the clothes / ornaments that were worn at the time of the puja (which is symoblic of washing away all the ill-effects). So my little advise is avoid wearing diamond/ navaratna rings and Rado watches and brand new Lee jeans etc. Wear a dhoti for pooja and avoid your costly clothes / ornaments as much as possible. On the way to /back from the temple don't visit any other temple. Reach your home directly after Rahu Ketu Sarpadosha Nivarana Puja or Kala Sarpa Pooja. 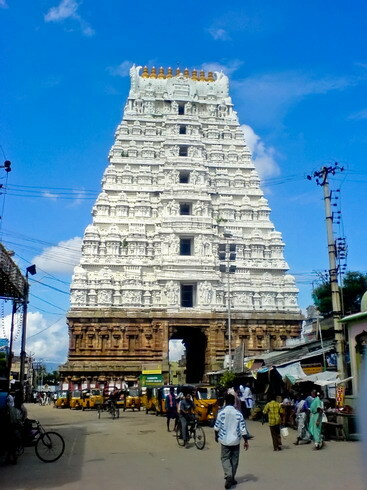 Sri Kalahasti temple is dedicated to Lord Shiva. It is one of the five major Shiva temples. It is situated on the banks of the river Swarnamukhi and it is 36 kms from Tirupati, Andhra Pradesh, India. Thanks for this information about this GREAT TEMPLE. Thank u very much...this is a really useful. but i have one query, pooja is for one day or 2,3 days. Guru Brahma Guru Vishnu Guru Devo Maheshwara. Guru Saksha Par Brahma Tasmisi Guru ve Nama. My heartful Wishes to Sri Narendra Babu Guruji. i would like to know one is there pooja going for naga Prathista pooja? i want to go srikalahasthi for the pooja. please suggest whether i can go with my parents or with friends. Please send me the information as soon as possible,as I have to make my train reservation depending on that. Thank you very much. Very useful information. I want to know can I perform the puja for my daughter as she is not in India. Or does it have to be performed by the person herself? I want perform Ruthra abisheham on Sep 2 How Can I Book For the same. just want to know whether these puja's like rahu-ketu and kalasarpa dosha will be perfomed on sunday's also. Plzz give me some information regarding this i'm planning to go on October 2 (i.e. sunday). brinkka2011 says: Thanks so much for posting all of the good content! I am looking forward to reading more. I have planned to visit Kalahasti temple during this weekend and would be arriving by late Saturday evening, so that we can spend full Sunday (16th Oct) at temple till evening before we travel back to Chennai…would request you to advice on the facility available for making/offering pooja at temple on Sunday and if there is any advance reservation available to avoid crowds? I would be travelling along with my wife and two childrens…I particulary not coming for rahu-ketu but to come over to pray for my Son’s well being as he is unfder medical treatment…is there any other pooja possible on Sunday morning timings apart from rahu-ketu? Thanks for easy information Guruji.nice to know about the place in detail before visiting. i want to visit sri kalahasti & perform kalasarpa pooja for Kalasarpa dosha nivaran which is found in my Jataka(kundali) before marriage i don't Know its found in my kundali, but it effect my married life,(till devorce)So i visit SriKalaHasti & prey for feature. im having kuja dhosha and sarpa dhosha , i wanted to go to the kalahastri to get dhosha nivarana. so, i need information about the pooja timings and when i shd do that pooja? for both the dhosha same pooja or different pooja is there? how many days it takes? for me its too urgent to do get dhosha nivarana.. plz send the details to the given mail id, savithareddy89@gmail.com. plz reply to this mail as soon as possible..
Gurujige sastanga namaskaragalu. After the sarpa dosha puja done at srikalahasti. For how many days the person has to leave non-veg. please suggest me Guruji. Guruji suggested to leave it permanently. 1. We need to do the rahu ketu shanti pooja for my brother(cousin) and sister.Currently my sister is here but brother is abroad. His mother is here,can she do the pooja for him and later when he comes here he can visit the temple? 2.Which day and time is ideal? We are planning to come on 6,7 or 8 th of Jan.
guruji very good info. as my son karan 7years and 8 months old has kala sarpa dosha. and our astrologer tole us to perform pooja at srikalahasti. so i wanted to know about pooja timing. and other details. please let me know all detais my email id is namuaj@yahoo.com. thanks. im having kala sarpa dhosha , i wanted to go to the kalahastri to get dhosha nivarana. so, i need information about the pooja timings and when i shd do that pooja? for me its too urgent to do get dhosha nivarana.. plz send the details to the given mail id, hr.kalpanayadav@gmail.com. plz reply to this mail as soon as possible..
Hi, All the contact details are given above in the post. Kindly contact the temple authority for more information. Sobhagyajyotish provide Kaal Sarp, Kaal Sarp Dosh, Kaal Sarp Yog Puja Call Us +91-9654186005 . All arrangements will be designed by Sobhagya Jyotish. Details of puja and kinds like as Kaal Sarp, Kaal Sarp Dosh, Kaal Sarp Yog Puja, Kaal Sarp Yoga workouts, Kaal Sarp Yog, Kaal Sarp Yantra, Kaal Sarp Dosh Puja etc. are available in our office. I'm really grateful for your article. I have a small doubt, during the puja i was given a couple of dress pieces, what should i do with them? I didn't discard them as i wasn't sure what to do with it. Consult any other knowledgeable Pandit or visit the temple personally and get the information from temple authorities. Thanks for all the information mentioned in this blog, it is very much helpful for all those who want to visit Sri kalahasti Temple. Our shastrigalu said thet i have to do this pooja for four years & i have all ready done twice & When i did the first pooja they told me to do it on my Birth star day, for the past two years i have done as per there instruction and even next month on 13th aug iam going to do the pooja. but in the above mentioned information i never came accoress any infomation regarding the birth star day for offering the pooja. Kindly educate me for the same. Thank you for you kind appreciation. Nothing wrong in performing on the day of Birth Star. It all depends on each individual, depending on the time that is comfortable, to them they perform this pooja. Very informative about the pooja and its accomplishment. Regards for the information provided on this blog. http://www.srikalahastitemple.com/the site has all details. More over do not approach any mediators. book tickets thru www.apsrtconline.in and return tickets as well. For 300, will do Pooja at 15th Century old hall at outside temple. For 705, will do pooja at 17th Century old hall at outside temple. For 1500,inside temple. No difference in the Poojas.ALL ARE SAME. Remember Ur name, Rasi, Nakshathra, Gothram(Siva/Vishnu). For eg: For doing Pooja on Sunday at 4:30 PM. Get the Rs.300 coupon at 2:45PM and stand in the queue. They ll give instructions in at least 5 languages. Pooja starts at 4:30 and ends at 4:50. After that to avoid rush Get Rs.50/- Special Dharshan ticket. You may come out from temple at around 6PM take bath and leave ur weared clothes and wear new dress. If u book return ticket to return Chennai at 7:15 Bus then u would hav enough time and reach bus depot on time. Temple to bus stand Rs.15/head. do we have to book for pooja early..appointment earlier..
do we has to avoid non-veg? if so how many days early.. Which is the better place to stay..
i have kalasarpa dosham ,n asked me to perform pooja at nasikh, but i planned to perform pooja at kalahasthi nexxt any weekend i.e,8th 9th or 15th,16th of sep.
On which day pooja effective..? im six mnths old married gal n my husband doesnt have any kundali,so should i perform with my husand or myself..? what all should carry along with us..clothes(colour)? how many pairs? Are rooms available all time? *any advance booking for pooja* How to contact? my self Nilesh from Gujarat. Since last ten years of marriage we are not blessed for children.Please advise for suitable pooja and any other pooja for pitru dosha and guru shani dosha nivarana vidgi. Thanks for the info, whoever wrote it. This helped to get prior info on the puja/temple. This place is great, the energy is real holy. Lot of people visit the place and the temple is huge. Normally people who visit Tirumala, visit this holy place also. If you are visiting the first time, get a guide inside the temple. This will save you time and energy (paying the guide for his help will be a good deed too). Else one will be lost in searching for the place. 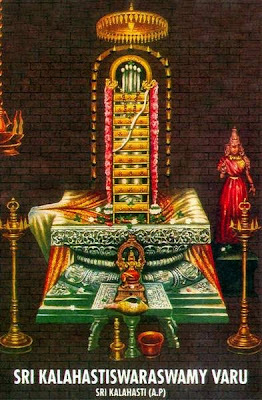 I have been reading alot about the Kala Sarvam Dhosam Puja and I was advised to travel to Kalasti Temple to perform this Puja. I did read the best day to perform this Puja is on a Sasti day which is usually once a month and the best timing will be during Rahu Kalam. Can you please confirm if this information is correct. I was also told we need to be on strict vegetarian diet for 10 days prior to this Puja. Is this 10 day sufficient/acceptable? Understand its not advisable go to other temples immediately after this Puja. How about the next day. We plan to go to Thirupathi the next day morning. i have performed kala sarp dosam puja and during returning to my home i had met wid an accident.so m little bother whether i have not done proper puja.or through this i got rid from dosha.during returning to my home i had not taken bath after the puja also,is it d reason it happend so.plz mail me ur suggestion. Very good Article with quit informative and guided well. after a long time i read nice informative article regarding our temples. Thank you Very much for your valuable information and guidance. Carry on as per your schedule. No issues in it. Offer your prayers with full devotion. Thanks for the clarification Sir. Thank u sir ! you have given invaluable information which helps the people a lot. My husband has kala sarpa Dosha and we were asked to do this puja at nasik. Will doing this at kalahasti give the same results? ?we have a 4yr old kid..can he also sit with us during the puja? ?.is it required that we all should be present at the time of puja? ?Please advice me..my email Id is. Saili_patki@yahoo.co.in. 1) Do i need to take appointment or i can come any time any day? 2) Do i need to come along with my family or alone also i can come for the puja? 3) Do i need to ask my pandit which puja i have to do? As somebody told me there are many types in this kal sharp dosh. I was planning to go to kukke subramanya temple but did not want to wait for long time as they will give appointment after 2 to 3 months, so when i was planning to go there somebody told me they will ask you which Seva you have to do...so am little confused with this Seva word, what exactly i have to ask my pandit and say the same at the time of interview? All your queries are answered in above post. To get more information, just visit the temple once, have darshan and get information on your seva, accomodation etc.. Perform it in your next visit. Thank you for such a detailed information. I am told I have "Rahu Ketu Chandra Kala Sarpa Dosha". Which ones should I go for? I am told I have "Rahu Ketu Chandra Kala Sarpa Dosha"
What is the difference between these four apart from the Seva fee? Consult with the person, who has told that you have Rahu Ketu Chandra Kala Sarpa Dosha. 1.Can we perform it on Sunday? Is it auspicious on this day? 2.Are there any restrictions on non-veg food before and after the pooja. If so, for how many days? 3.For marriage which pooja to be performed? heard it should be done 3 times,and is it necessary there to wear only saree or skirt and top? I want to come and do this pooja on 2nd March at rahukalam. I am coming with my wife. Can we wear dhoti kurta and do the pooja (Is it required to wear new clothes or old clothes will also do). Sarp dosh and nag dosh are they the same? My life is totally miserable, never could find time to go any where. Will try to travel to kalhasthi, thanks for all the info. Married for 9 years and we do not have any children. It is being told that we both have kaal sharp doshas in our kundali for which I would like to perform pooja. 1. Is it possible if I can only be present at the time of Pooja and not my husband. 2. Can it be done on arrival on the same day or we have to book an appointment. Please Guruji...please reply to this. After the pooja, is it necessary that everyone accompanying my son should take a dip in the river, shed their old clothes and wear new one OR this ritual is only for the person who has sarpa dosha and for whom the pooja is being performed. Kindly let me know. My email id is priyams09@gmail.com. We are planning to come to the temple on Monday or Tuesday (15th or 16th April 2013). please please tell me After performing Rahu-ketu sarpa dosha puja it is mandatory to return back home and do not visit any temple meanwhile ? So If i perfrom Rahu-ketu sarpa dosha puja or not ?? I am from malaysia ,planning to perform Rahu-ketu sarpa dosha puja .Can you help to advise ,how to come over there from madras,when is the right day to do puja. It will be good if i have your contact number for me to call directly to clarify on my doubt. 3) Do i need to ask my pandit which puja i have to do? As somebody told me there are many types in this kal sharp dosh. somebody told me they will ask you which Seva you have to do...so am little confused with this Seva word. Which seva shall I suggest. 4) Guruji can u explain which Rasi, Nakshathra and Gothram iam from if I give my all details? * How many days the person has to leave non-veg. please suggest me Guruji. Visit the temple first, get the answers for all your queries and perform the respective seva in your next visit. So that lot of confusions can be avoided. i want to come this temple and conduct sarpadoha pooja, so what i have to do , i need to book for this pooja or without booking i can do this pooja. iam from kerala. 1) Should she go alone or can I also accompany her? 2) Should she alone do the puja or should I also do? Visit the Temple one day before and get know about the temple. The best day and timings to do puja is on Saturdays at 9:00AM. Everyday it will start from 6:30 AM till 9:00PM. You need to purchase ticket on the same day. There will be three categories 350/750/1200 of tickets. There will be flower man who is selling lotus flowers for 40Rs just beside the ticket counter. Purchase the flowers and wait in a queue according to the category(350/750/1200) locations. Break 1 coconut before entering as they guide you. The poojari will chant mantras in Kannada, Telugu, Tamil, Hindi according people need to chant. There should not be hurry-burry. Be patience and do not afraid of God. You entered the temple because of Dosha. Believe in Sarpas and your mind should and body should concentrate only on prayer. for 2-3 min you will be given time to pray inside and to ask the God to remove your dosha. It is the bestest time in your life. at the end poojari say keep 101Rs on the beetel leaves in front of the Rahu Ketu and you will be adviced to put the Rahu Ketu idols in the hundi which is inside and near to the Vayu Lingam(The main God). one can visit nearby Subramaniyam Swami Temple and offer milk to the God for 7 Tuesdays. Dear all, please help me i am in need of help of you all. My fiance is having sarpa dhosam and we have to do dhosam pooja in sri kalahasti temple. september 7, 2013. Is it ok for us to do before 2 days and after pooja we will be going to tirupati temple. So please tell me any suggestions for this. Your comments and reply will be useful to for my life. I'm planning to visit the temple in Aug'13 along with my family. I've planned to perform pooja on Friday and then move to Tirumala for darshan at Balaji temple on Saturday morning. Want to know if pooja at Srikalahasti may be performed before Balaji darshan? Also should we buy 4 tickets for all family members? im from malaysian currently im staying at london,im not geeting pregnant even its going to be 2 years,according to my jathagam they said i have kala sarba thosam,i need to do some pooja at srikalahasti temple.so 1)please let me know it is july,august,september are good month to do this pooja? My husband has Kala Sarpa Dosha and we were recommended to perform the kala sarpa dosha shanti pooja and my daughter also has mild kala sarpa dosha and were told it has to be performed once shanti pooja is done for my husband, we then have to perform the pooja for her. We are visitnig India now. Can both poojas be done on same day. How long are these poojas? Are there any restrictions before and after the pooja? Are there are specific days we should look out for? Does his parents also need to be present for the pooja, meaning is it compulsory? We want to get it done before 15th of this month(August). I would really appreciate if you can respond. I'm from Punjab & visiting Tirupati in Aug'13 along with my family. Me & my wife have been told to do abhishekam with milk according to our age (no. of years). Otherwise, no specific pooja is told to us. I've planned to perform pooja at Srikalahasti on 16-Aug, Friday morning and then move to Tirumala for overnight stay and Balaji darshan on 17-Aug, Saturday morning. Want to know if the pooja at Srikalahasti may be performed before darshan at Balaji temple? Also if we will be able to get 94kgs of milk at the spot or we need to give some prior intimation. The temple contact nos. are not responding. Need to get some clarification... planning to go tirupati 31/08 on Saturday & sunday 01/09 perform the kalasarpa dosha pooja. Or it is advisable to do the kalasarpa dosha pooja then go to tirupati. Is Sunday the best day to perform the pooja? Need some advise on this. Wish to get Kaalsarp dosha puja done asap as I was advised to get it done at Kalahasti.Wish to know the details of actual and online epuja ,please revert asap. Hi, I plan to visit Kalahasti sometime in December 17th 2016 main intention to carry out dosha removal pooja for my family. Base on information gathered after dosha removal pooja one should go back home directly without visiting any other temples. Is this ruling applicable for those residing in overseas as well? Please clarify. Could you advise on Stay near the temple for outsiders like me?